Judy’s honest sharing of feelings shows we are not alone in our grief; that our feelings are a normal and natural part of life no matter how difficult it may be at the time. Now, nearly five years after her mother’s death, and with this, her second book that follows the acclaimed 'MUM MOMENTS - Journey Through Grief', Judy takes us on the next part of the journey. "Judy lives the reality that death is not the end, that love and a relationship are much stronger. Her heartfelt letters to her mother offer a clear insight into the power of this Love. By sharing this journey others will gain strength and confidence to grow their own relationship with their loved ones." “Jude’s writing is directly from the heart. 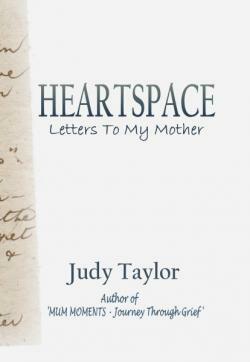 Her new book, ‘Heartspace…’ is full of raw emotion, honesty and vulnerability. Jude gives us all permission to fully connect with, embrace and express all aspects of loss, grief and coming to terms with losing a loved one.